She had been hosting Jewelry Bars for quite some time, ordering and even earning her favorite Origami Owl® pieces, introducing more and more friends to what they all found irresistible – O2’s meaningful charms, Living Lockets and bracelets. Marie Gonzalez brought so much business to her Independent Designer (and good friend), Sarah Wolf Solano, that she said, “Sarah would tell me, ‘Since it’s your friends doing all this ordering, you should sign up.’” She admits, she did love the jewelry so much she had considered becoming a Designer, but Marie was looking for something special, for a sign, before she made the leap. “I had been wanting to join for a long time, but I was waiting for one specific charm – the adoption charm – before I did. My friend would email me sneak peeks of what was coming out next. When she sent a video with the adoption charm in it, I knew it was time,” said Marie. She signed up with Origami Owl in the fall of 2015, within just a couple weeks of the charm’s debut. It was also when she put together her now-favorite locket – a Mini Rose Gold Locket with the AB and turquoise crystals surrounding just one starring charm: the adoption symbol. 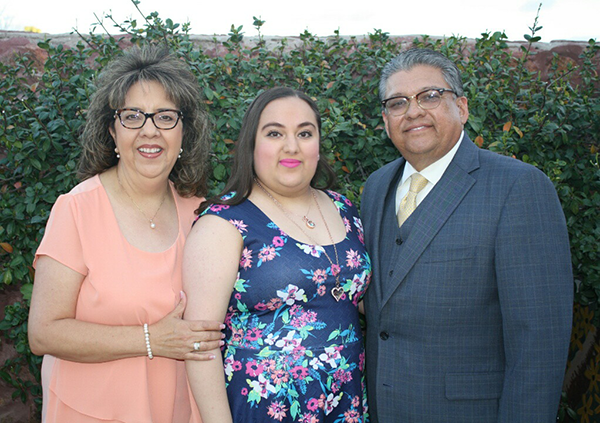 Marie works alongside her father at his Allstate Insurance agency – a career she is passionate about. “I’m next in line when my dad retires in a few years. It’s been a blessing to watch him build this foundation; I want to continue his reputation. We joke around a lot at work. I love working with him. He’s my best friend, my everything,” said Marie. As someone who lives life full of gratitude, we’re just as grateful that Marie’s journey led her to Origami Owl, bringing all her love, faith and joy to our O2 family!